The Columbia River Highway was dedicated with this ceremony at the Vista House on May 5, 1918. We know several Hood Riverites are in the crowd because we have their own photos of the event. Why didn't I use one of them instead of this postcard? While I've got good tools to clean up scans before sharing them with you, sometimes it nice to start with an image that is in focus, well-composed, not crooked, and properly exposed. Vista House has recently undergone a major renovation. Here's a more recent view. No doubt it was quite the occasion and surprisingly it seems as if the winds aren't blowing at hurricane force. Military is well represented up there in front of the door. I wonder if those might be the Royal Rosearians out of Portland on the left side. They have the white suits on and one has the cap like they wear. Look at those wonderful old cars. Bet they had to "chug" to get up there..
That is how I often heard it referred to. Multnomah County taxpayers had to fund most of the cost for building the Vista House and many of them were not very gracious in there attitude about the structure. The first time I visited Vista House I was surprised at how neglected it looked. Later, the Gorge Commission came into existence. There were people across the river on those Washington hills who were not able to get a building permit to build a new home. Some of them were families who had lived there long before Vista House was built, so there were a lot of bitter feelings toward the building that was constantly in their view. Especially when the sun would sparkle off of the windows. Is the white haired and bearded man holding the corner of the flag familiar to us from previous HHR photos? The speakers and presenters at the Dedication: I was going to give links for some of these interesting men, but got flagged for spam so you can google them. Frank Branch Riley delivered the Dedicatory Address: He was a lawyer, alpinist, singer, actor, dramatic critic, author, good roads booster, orator, lecturer and ambassador of good will. There is an article and photo of him online. Frederick V. Holman: He delivered the response. Born in Oregon Territory. Prominent Portland Lawyer. President of the Oregon Historical Society and helped organize the Rose Society. Wikipedia has an article and photo. Simon Benson: We all know about him..... had agreed to pay the cost of the structure should Multnomah County fail to do so was present. The community of Holbrook in Multnomah County was named for the Holbrook farm. Arnold A. Muck was county commissioner and sand and gravel contractor. I couldn't find a lot about him. Henry Pittock: Publisher of the Oregonian and President of the Vista House Association. George L. Baker: Controversial and colorful mayor of Portland, made the presentations. He was born in The Dalles. Photos and articles on line about him. "A spectacular pageant of raising the flag, led by the Royal Rosarians, concluded the ceremonies." The white bearded gentleman might be Holman. Thank you so much l.e. for all this information. Lots of important dignataries. I just happened to be reading Tom Kloster's blog about George Shepperd's contribution to the Columbia River Highway. As usual, Kloster has done an excellent job in his research. Interesting reading with some connections to Hood River. Shepperd's Dell is just west of Crown Point on land that George Shepperd donated. "found himself seated among the most honored guests at the spectacular dedication of the Columbia River Highway at Crown Point. Shepperd was recognized in the formal program along with historical luminaries like Sam Hill, Samuel Lancaster, Julius Meier, Simon Benson and John B. Yeon. The ceremony was kicked off audaciously by President Woodrow Wilson unfurling an American Flag remotely by pressing a telegraph button in the White House, "
I suspect from the photo in Tom Kloster's article, George Shepperd may be the bearded gentleman. I should clarify that the above quote was the 1916 dedication for the Columbia River Highway at Crown Point. The Crown Point Vista House had not yet been built. 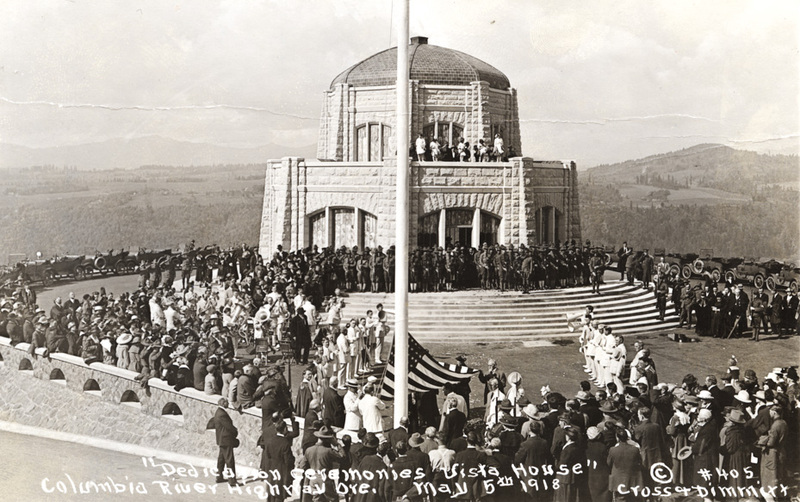 The above photo is the dedication of the Vista House in 1918.